Flemish Giant Rabbits are the mammoth rabbits of the rabbit world, and the basis of all giant rabbit breeds such as British Giants, Continental Giants, and Gigantes de Espana (Spanish Giants). As early as the 1500’s, rabbits "four times bigger than ‘normal’ rabbits" were already living in the area of Verona, Belgium. Exactly when the actual oversize rabbit giant genes first surfaced will probably remain forever unknown. It could have been a random mutation. Some breeders think the source of the jumbo-economy-size genetics is due to selective breeding utilizing the old ‘Steenkonijn,’ or Stone Rabbit, a Belgium rabbit that typically weighed one ‘stone,’ or 3.5 kg (7 pounds 11 ounces), and the now-extinct and very large "Patagonian Rabbit," which weighed as much as 16 pounds. The name Patagonia is a reference, probably not to Argentina, but to a Spanish term meaning "big foot." On the other hand, the belief that giant creatures lived in Patagonia was common at the time, making the name a logical one for a very large rabbit breed. Fast-forward to the mid-1800’s. Multiple Belgian clubs were already regularly holding weight competitions featuring their giant rabbits. The winning Flemish Giants weighed up to 19 pounds in the latter half of the 1800’s. By the end of the 19th Century, Flemish Giants were recognized in Belgium in two colors, gray agouti (white bellied) and iron gray (dark bellied), and various breeders began importing them to their various countries. The Germans changed the name of their Flemish Giants to German Giants in 1937. They are genetically 100% Flemish Giants, however selectively bred to conform to the particular specifications of the German standards of perfection for the breed. Flemish Giants arrived in England in the early 1900’s. There was apparently a difference of opinion as to which breeding goals to pursue and which colors would be permissible. Perhaps this is why one can find a British Flemish Giant which is only bred in the UK and in only one variety, and the larger British Giant Rabbit which resembles the true Flemish Giant, and which is found in various colors. Japanese Jumbo Whites resulted from crosses between Flemish Giants and New Zealand Whites. They enjoyed their heyday before 1950, but now their numbers are so few that the Japanese Agriculture Association protects the breed. The generally accepted breed history is that the Spanish Giant is the result of crosses between Flemish Giants and two Spanish rabbit breeds, the Lebrel Espanol and the Belier, a lop. Subsequent breedings selected for erect ear carriage and size. By 1900, the breed known as the Gigante de Espana (Spanish Giant) was recognized in Valencia, Spain. Flemish Giants arrived in the USA at the very end of the 1890’s. They arrived here only partially pedigreed, yet the demand for these giant rabbits was as monstrous as the rabbits themselves. It was not long before American breeders organized their own clubs and standards of perfection for the Flemish Giant. In 1924, the Flemish Giant Rabbit became a charter breed of the newly formed American Rabbit and Cavy Breeders Association, the forerunner of today’s ARBA. As far as we can tell, every single giant rabbit breed today is based upon the Flemish Giant Rabbit as it was known circa 1900. The British Flemish Giant is catalogued in the BRC’s "Fancy" section. Its type is large, roomy, and flat, being broad in forequarters and hindquarters. Does are expected to have an evenly carried dewlap. Minimum weights are 4.97kg (11 lb) in bucks and 5.44kg (12 lb) in does, with no maximum weight. The British Flemish Giant is possibly the ‘smallest’ of the giant rabbits, despite its massive description. The effect is one of an overall uniformity in color (though tail may be darker on top). The belly is white, with a blue/gray undercolor. The color is known as a "dark steel gray," though this by definition is a false steel, because the belly is white. The British Flemish Giant is only bred in the UK, and is not as large as the typically massive Flemish Giants found in every other country. The breed is rare today. The British Giant Rabbit is similar to a true Flemish Giant as recognized throughout the world. It is a massive rabbit with a minimum weight of 13.5 pounds (6.14 kg), and no maximum weight. Its type is large, long, roomy, and flat, being broad in the front and having hindquarters that are firm and muscled. Skin should not be ‘baggy,’ however. Fur length is up to 1 inch (25cm) long. Ears are erect, and no longer than 7.5 inches long. British Giant Rabbits are recognized in White (red-eyed or blue-eyed), black, dark steel gray, blue, brown-gray, and opal. We strongly suspect that Continental Giant Rabbits are German Giants bred in the UK. Contis, as they are nicknamed, are posed up on front feet, but should not be arched at the belly. They are heavy boned, solid, and powerful, with a strong back and well-rounded and muscled hindquarters. The coat is roll-back, shiny and dense, with hairs being up to 1.5 inches (4cm) long. Ears are expected to be approximately 25% of the body length, or a minimum of 16 cm (7 inches) long. The bigger the animal, the more points they receive at the show table. Animals weighing more than 15.8 lb (7.0 kg) are granted the full 10 points allotted for weight. This is the part of the standard that encourages breeders to strive for as much size as possible. Colored Continental Giants have been recognized in black, dark steel, light steel, agouti, red agouti, opal and yellow. A number of breeders have imported championship-quality Conti's to the USA. Efforts are underway to obtain ARBA recognition for Continental Giants. These animals will meet the standards for the British Rabbit Council, and ARBA, once US standards are written and the breed is accepted. Are you interested in the gigantic Continental Giant? Click this link to find a breeder as near to you as possible. The White Continental Giant resembles the Colored Continental Giant, however it is a bit finer in bone and more elegant in appearance. The maximum 10 points for weight are granted at 'just' 6.5 kg (14.4 lb) or more. Eyes can be pink or blue. Coat is snowy albino white. White Continental Giants are seriously faulted for undersize in either body length or ear length. American Flemish Giant Rabbits are massive, but don’t quite achieve the truly gigantic proportions seen in a few strains of Continental Giants. This does not mean that Flemish Giants do not have the same size potential of the Continental Giant. They do, but the US Standards of Perfection don't incentivize massive size. Additionally, Flemish Giants in the USA do not carry themselves as flat as do the Flemish in other nations. American breeders focus on their ideas of overall "balance," while still specifying no maximum weight. In the US, a slightly smaller, but balanced rabbit will win over an enormous Flemish Giant that does not appear sufficiently balanced. This is the part of the USA standard that places less emphasis on a gigantic rabbit, resulting in giant rabbits that aren’t quite as ‘giant’ as their cousins in the UK or Europe. The Flemish Giant body type is mandolin. Its body should be as long and as powerful as possible, without being fat. It should carry a heavy bone. Bucks and does are considered adults at 8 months of age, at which time a buck’s minimum weight should be 13 pounds, and a doe’s 14 pounds. 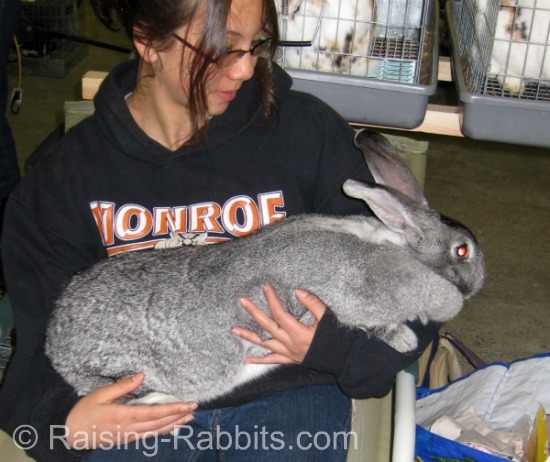 The standard specifies no maximum weight for Flemish Giant rabbits in the USA. In the USA, Flemish Giants are recognized in these varieties (colors): Black, blue, fawn, light gray, sandy, steel gray, and white. 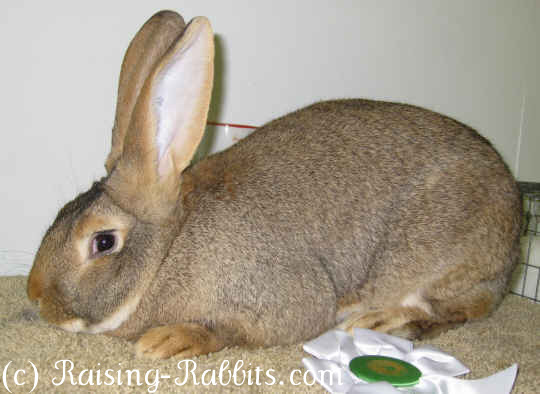 See photos of all Flemish Giant Rabbit Varieties in the USA here. Spanish Giants are critically endangered today, having a purebred breeding population of less than 500. This is exceedingly unfortunate, as this breed is known to be resistant to digestive problems, and rarely have any reproductive problems. It was the boom in the favorite meat breeds, New Zealands and Californians that decimated the numbers of Spanish Giant Rabbits. 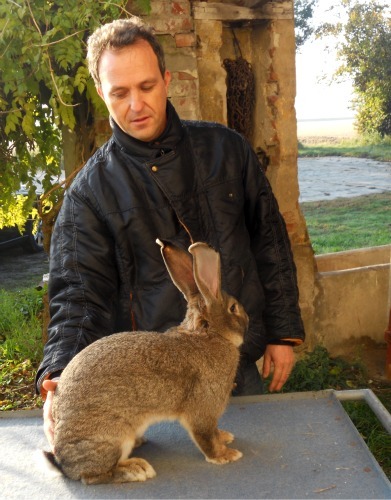 Pictured: Marco of Italy shows off his champion Italian Flemish Giant Rabbit. This excellent animal took second place in an International Rabbit Show in Switzerland in 2011. 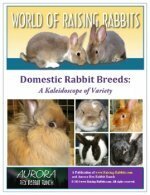 Interested in other domestic rabbit breeds?